Jagruti's Cooking Odyssey: Celebrate Makar Sankranti with Mixed dry fruits and Seeds Brittle ! 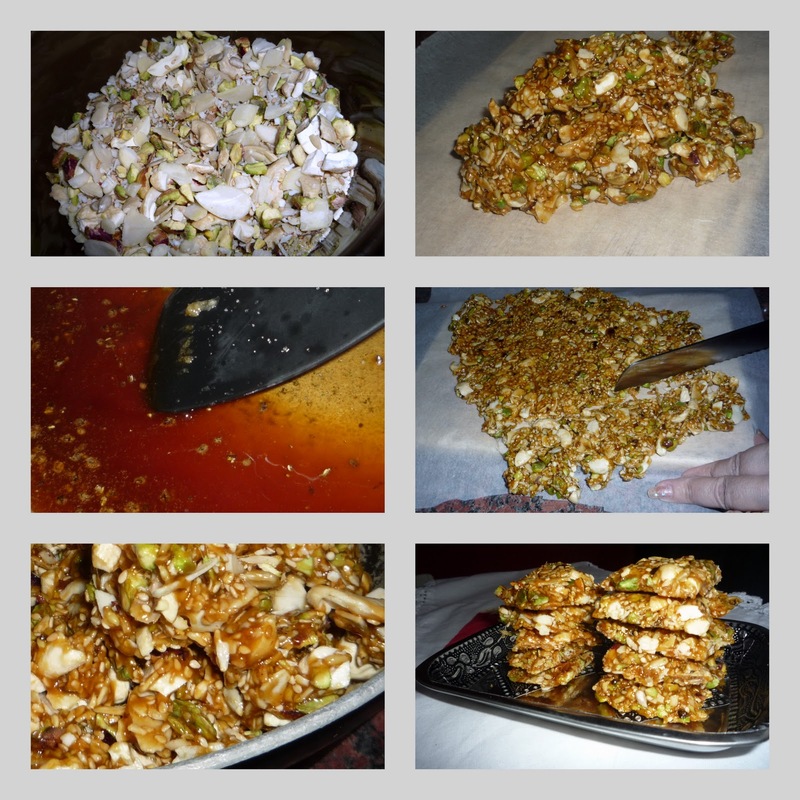 Celebrate Makar Sankranti with Mixed dry fruits and Seeds Brittle ! 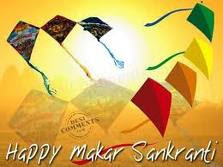 On this auspicious day of MAKAR SANKRANTI, I would like to wish you all very happy and safe Makar Sankranti....! Makar Sankranti is a major harvest festival celebrated in various parts of India. According to the lunar calendar, when the sun moves from the Tropic of Cancer to the Tropic of Capricorn or from Dakshinayana to Uttarayana, in the month of Poush in mid-January, it commemorates the beginning of the harvest season and cessation of the northeast monsoon in South India. Makar Sankranti is celebrated with distinct names and rituals in different parts of India. In the states of northern and western India, the festival is celebrated as the Sankranti day with special zeal and fervor. The importance of this day has been signified in the ancient epics like Mahabharata also. In Northern India, people offer thousands of their colorful oblations to the Sun in the form of beautiful kites. The act stands as a metaphor for reaching to their beloved God, the one who represents the best. Makar Sankranti identifies a period of enlightenment, peace, prosperity and happiness followed by a period of darkness, ignorance and viciousness with immense sorrow. The name Uttarayan comes from joining two different Sanskrit words "Uttara" (North) and "ayana" (movement towards). Uttarayana (Makar Sankranti) is the day when the sun starts to travel towards north as a sign of coming summer. People from all age groups, come to the roof of their houses and apartments to fly kites in celebration of the festival. 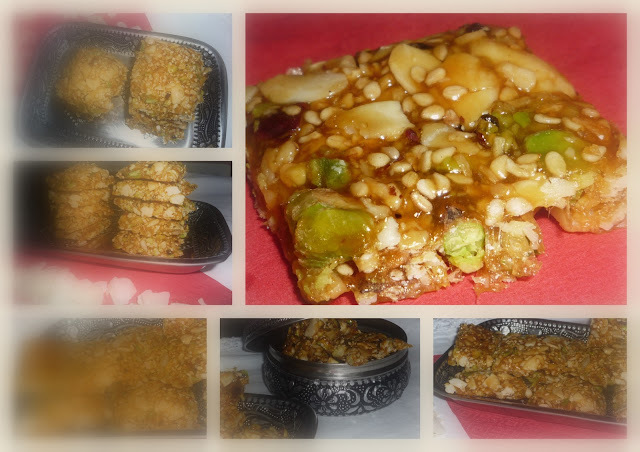 Healthy and delicious mixed nuts brittle.Happy Sankranti. Happy Sankranthi to u and ur family!! THATS QUITE AN INFORMATIVE POST ON MAKARA SANKRANTI. YOU GOT PATIENCE DEAR. DON'T LOOSE IT. I love brittle but have never seen one made with this many seeds before! Delicious. Am just drooling here, happy Makara sankranti wishes to u and ur family..
Happu Sankrati a very informative post jags and the brittle looks so so good, i love these sugar ones and the one we get in south with jaggery, wish i had few right now. very nice and informative post.. we tamilians call it Pongal. nice to know about kite flying and manza. here also they use the term. chikki looks very tempting. Wow.. tht looks really good... like it with the dryfruits..
Chikki looks perfect and healthy with those nuts in there..